How To Bathe A Dog That Hates Water - Simple Tricks & Tricks? Simple tips and tricks on how to bathe a dog that hates water? How to bathe a dog that hates water? If that’s your concern, please relax and worry no more. Because it is a common thing with most dogs. Of course there are some lucky dog owners too. And their dogs love splashing water and swimming and taking a bath every now and then. Unfortunately, that is not always the case. So if you have a hard time giving your dog a bath, there are simple things you can do to make bathing time more fun and easy. Yes fun for you as well as your favorite dog. Bear in mind dogs do not hate water (cats do). Of course, they will not like it either if it is another boring thing for them. Honestly, who will? Or, somehow they had a bad experience with water at some point. But these behavior can managed and changed for the better. Think dog psychology for a bit (we will talk about it little later). So how can you make bathing time a fun thing? That’s exactly what I am going to share with you in this article. Recall your journey as a child – why? If we go back few years from now, and recall what we did as a child, then I suppose it will make a little more sense. My parents had to prompt me all the time to take regular baths. And they had to reiterate time and again the importance of good hygiene etc. It may sound weird my friend, but the same thing is true for our dogs as well. Yes they do understand what we tell them. And they learn the way we treat them. Like human beings their minds are programmed from a very young age. OK, so how do you make your dog understand that bath is a good thing for him or her? Not hard. Of course by making it more fun, rather than making it another super-boring ritual. Something that your dog wants to do. And practice it long-enough to turn it into a habit – by creating positive associations. You know what I mean. From my 40+ years of experience as a dog owner and a dog lover; yes I had a dog from when I was maybe 5 years old. I know: Dogs do hesitate to take a bath. They might love to mess around in the rain, water puddles and what not. But when it comes to actually taking a bath, they may give you a real hard time. Just like a child. So ask what would you do if a child refuses to take a bath? Obviously make it more interesting and fun for them, right – maybe have some toys and plan a fun bath-time activity in the tub. Think what they do with kids in Play-School or Kindergarten. They keep it super-simple and make it a fun thing. And repeat it over and over again, so that it turns into a habit and becomes their second nature. Same tactics, same psychological strategies can be applied to your dog. I love Cesar Millan in the way he uses Dog Psychology to train dogs and even transform them. If you’re a dog lover you know who he is. Below is a simple step by step guide on how to make your dog shower-friendly! This is what I do: set a trail. Put their favorite treat on the floor leading them to the bathtub. For your dog it will be a fun activity. And I do it few times a week not just during bath time. So that they get used to the bathroom or wherever I would like to bathe them. And they become familiar with the place. When you do that, they will associate bathroom as a place of fun, and that will make your life much easier. I also tried putting their treat in the bath-tub. Obviously, for a little puppy you have to gently pick them up, and put them in the bathtub so they can eat their treat. Do not rush.Do it slowly with enough patience this definitely works. Like anything else, it will require you some practice. Before taking the dog to the bathtub, try washing him with a sponge to relax him. Massage his coat and feet and help him adjust to your touch and relax him. You could even pamper him a little by keeping his favorite toy in the bathtub. Or, keep a treat he or she likes. Help him relax while you clean the dog with wet wipes and sponge. Do not start by pouring water on the dog. I use a mug and pour water on my hand first and slowly rub that on their body. This is a very gentle approach. Don’t rush practice mindfulness. See how I gradually introduce the dog to water. I never rush them and that’s what many dog owners do, causing unnecessary issues. And I use this same technique even with my trained grow-up dog. Let your dog get comfortable with the tub first, and the sound of running water. Do not start with splashing water at him, instead, take him to the bathtub and help him familiarize. Make it a more gentle and gradual process instead of suddenly dumping a bucket full of water on your pet. Try pouring water on your dog slowly, and lovingly rub their back, then gradually progress towards the head and neck area. I always use my hand and use a small mug kind of to pour water. In that way, I find I have more control, and the dog is not overwhelmed, especially a puppy and when they are getting use to stuff. This way they will start to get used to the process. Keep rubber mat, clippers, brush, shampoos, whatever you need handy. I like to clean the face in the end. Note: Use a dog-friendly shampoo as the human shampoos tend to get too rough for those lovely beings. Take your pet for a long walk or jog before giving them a bath. Or, play with him in the park and get him tired. Why? Because it will drain his excess energy and he will be calmer and listen to your commands better. If you give him his daily dosage of exercise. It will also make him feel warm and tired, it is likely he will be more tempted to go and jump into that tub or the pool for a bath. Makes your job a bit easier! Nobody can resist a good shower to cool down after a thorough workout, right. But for a dog which hates water, this will take a little bit of time. So do not give up, you will surely find success. To help your dog get accustomed to the concept of bathing, try making him meet a water-friendly dog – yes easier said than done. 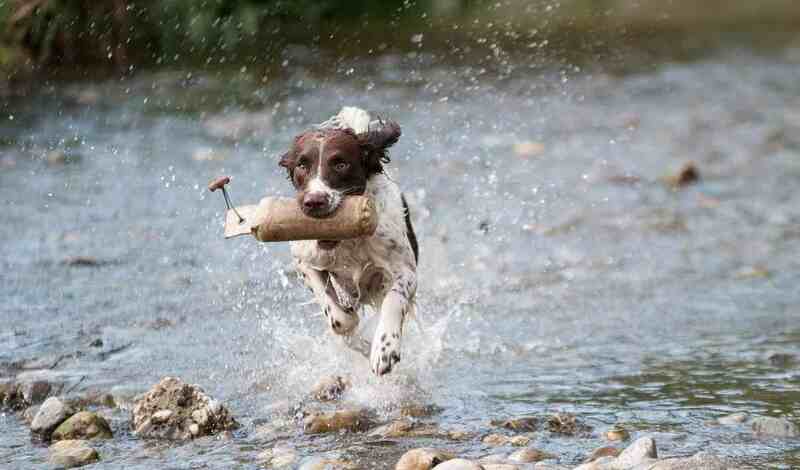 In that way, your dog will want to play with the other dog in water and that will greatly help. You can also try the water fountains in the parks, and introduce your dog gradually. It will be a fun thing for him/her at the same time they will get used the water splashes and those kind of stuff. More your dog socializes the better it is for you and your dog. Make sure the dogs meet and play before the shower and then see the magic happening. Another easy way to make your dog get into the bathing area is to bribe him with his favorite food. Make him/her eat there few times during the week and when you can. It is a fact that food has a calming affect and it builds trust. It also works for humans, and that’s the reason you’ll see during official meetings, free lunch is provided. Try this strategy and you will see that your pet is no more nervous and is happy after the meal. When you create a relaxing atmosphere it help in making him bathe easily. If you are still not able to make your dog bathe, then please seek help from the professionals or even friends who are good with dogs. Yes, there are professionals who would assist you and your dog get friendly with water. Please make sure that they get regular bath but not too often. Why? Because a dog’s coat has natural oils, which helps it to remain soft and silky, and prevents it from getting brittle or damaged. So if you bathe your dog too often the natural oils will be washed away, which we don’t want. What I do? I only bathe my dog when they are noticeably dirty or smelly. Plus every breed is a little bit different, so find out the expert recommendations for your dog breed. A new trend these days is dog spa. Of course there are spas for your pet as well! Slightly heavy on the pocket but some of them do a great job. After those massages and soothing therapies at the spa, the dog tends to feel extremely relaxed and comfortable, which is one of our goals apart from bathing them and keeping them clean. Once you are done with the shower, gently pat dry with a clean towel. Then try brushing the hair well after it is dry. Let them loose for a while and help them ease off after the shower. The dogs usually love running around after a good wash. Reward your dog with his favorite treat, so that he always associates bathing with the good things and looks forward to bathing on a regular basis.